The brown recluse spider is the most common venomous spider in the United States. It is found mainly in the South Central states, but has also appeared in large cities outside of this area. The venom of the brown recluse spider is the most potent of all the poisonous spiders in the U.S. The brown recluse is also known by the nickname "fiddle-back spider" because of a dark brown violin-shaped marking that is usually present on its back. These arthropods hide in dry, dark areas and can make their way indoors from time to time. The signs and symptoms of a brown recluse bite in an infant can be hard to spot. The most common first symptom of a bite is a round, red mark similar to a mosquito bite. There will be two holes in the center instead of one. With time, this bite mark will become swollen and develop a white ulcer in the center. The white ulcer will cause tissue death, or necrosis. At the beginning stages of tissue necrosis, a tiny black spot will develop. This spot will spread as more flesh is eaten away by the venom. Call your doctor at the first sign of a bull's-eye-shaped bite mark on the baby. 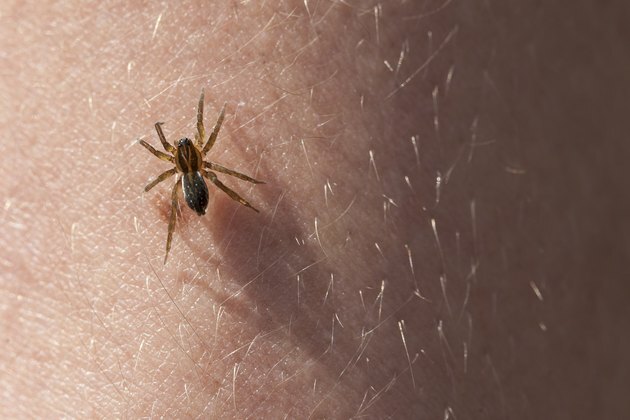 Elderly individuals, infants, and people with compromised immune systems have a greater chance of developing a severe reaction to a brown recluse bite. Severe reactions include difficulty breathing, a severe rash that spreads quickly over the entire body and is resistant to antibiotics, or in the most severe cases, death. Medline Plus lists difficulty breathing and high fever in the range of 104 to 106 degrees F. as severe reactions to bites. If your baby suddenly develops a high fever, is uncontrollably fussy, lethargic, or develops an intense body rash, seek medical attention immediately. A study conducted by the American Medical Association states that over 2,000 brown recluse bites are reported each year. The study goes on to state that most of these reported cases turn out to be something else altogether. The reason is that the brown recluse prefers to hide rather than come out into the open. Most bites occur when the spider is accidentally crushed in its hiding spot. Most deaths from brown recluse bites occur from necrotizing fasciitis, or severe allergic reaction to the venom. Although a brown recluse bite can be fatal, it is extremely rare. If you suspect a brown recluse spider bite, it is important to seek medical attention as soon as possible. The longer the venom is allowed to spread through the body, the more likely necrotizing fasciitis will spread and cause severe complications -- even death. It is also important to contact the Poison Control Center to report a case of a confirmed brown recluse bite.